Pale Green SuperLEAF 1-Gallon SuperPak! For those layouts in need of lots of premier leafy trees - available in 1-gallon super-size bag! Saybrook Sage SuperLEAF 1-Gallon SuperPak! For those really large layouts! Ideal for plants, bushes and trees in the saybrook hue. Juniper Green Tone SuperLEAF! Excellent leaf coverage for a variety of evergreen conifers and/or bushes. Maize Yellow SuperLEAF 16oz. Shaker! Pale yellow tone. Available in a handy 16oz. bottle sealed with a plastic "spoon-shaker" cap which provides two options for either spooning the leaves or shaking. Approximately 2 cups of leaves (by volume). Maize Yellow SuperLEAF 24 oz. ECO-Pak! Pale yellow tone. If you're tired of all the plastic bottles and are "ECOnomical", our NEW 24oz. bag (by volume) of SuperLEAFS are the ticket! Approximately 3 cups of leaves. Thats 8oz. MORE for the same price! Maize Yellow Tone SuperLEAF 1-Gallon SuperPak! For those layouts in need of lots of premier leafy trees - available in 1-gallon super-size bag! Rusty Orange SuperLEAF 16oz. Shaker! A New Autumn Tone! Available in a handy 16oz. refillable jar (by volume) sealed with a convenient Shaker-Spoon Cap. Approximately 2 cups of leaves (by volume). Rusty Orange SuperLEAF 24oz. ECO-Paks! New autumn tone! 24oz. that's approximately 3 cups of leaves. Thats 8oz. MORE than the Shaker Bottles for the same price! 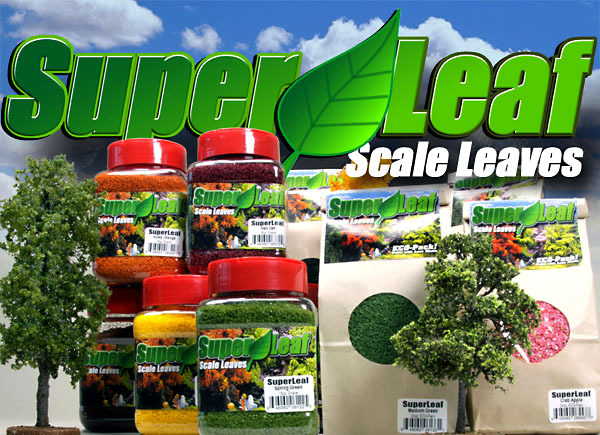 Rusty Orange Tone SuperLEAF 1-Gallon SuperPak! For those layouts in need of lots of premier leafy trees - available in 1-gallon super-size bag!